If that tittle doesn't get you singing the song, nothing will! But quit singing for a minute and come join in the challenge at Shopping Our Stash that has the theme - A Few of my Favorite Things! Yes, we want you to create a card (or project) and include your favorite things! It's that easy! Be sure and check out the blog of all the details and be inspired by the Design Team. Don't forget to use up that STASH! A few of my favorite things..........this was so easy since everything I have to go on a card are my favorite things! LOL! But I DO love ribbon (and lace is right up there with it), pearls (even though I'm not a pearl type girl), DP (it's all so pretty), nesties, images, etc.....you name it and I love it! This is NOT the usual type of card I create - at all......but thought I'd try it since I like all the elements on it. I used one of my favorite SU sets, Pocket Silhouettes, for the image and Watercolor Trio for the sentiment. The lace is some I found in a thrift store so long ago. I used a scalloped oval nestie and some DP from Prima. I've had this paper forever and just stare at it and never use it. The flourishes were sent to me from Carol over at Our Little Inspirations! What's not to love about those things.....so pretty and delicate! As I said, this really isn't a "Lynn card" but still like how it turned out. Thanks for stopping by.............and be sure and check out the Shopping Our Stash challenge. This is so pretty! I love the lace detail. Well All I have to say is that all your favorite things go together so nicely. This is a lovely card, Lynn. That lace is just gorgeous. Well, even if it's not your usual style, you certainly did a fantastic job on it, Lynn. I adore the lace ribbon and the way you tied it! Nice leaf swirl and great papers. Wow Lynn, absolutely beautiful card! The lace is especially pretty! Great card! Very nice, great job stepping outside what you normally do too. I love pearls and lace on cards but you would never know it by the way I dress! Lovely card, Lynn, love it's feminine appearance and the ribbon looks fab. I love that song and the movie is one of my faves to date. so soft and pretty! The lace goes wonderfully with the pastel papers! This is beautiful Lynn, love the backing papers and the stamped image is lovely. Beautiful embellishments too. This is so very pretty! Love the knotted lace you added. Isn't it fun to do something different once in a while? Pocket Silhouettes is one of my favorites too. It fits so beautifully in this sweet frame and the die cut is to "did" for! This is beautiful Lynn! I love the soft colors and how you've framed the image!! Gorgeous lace & pearls! You should love how it turned out! I do! Very soft and pretty! So beautiful and elegant! 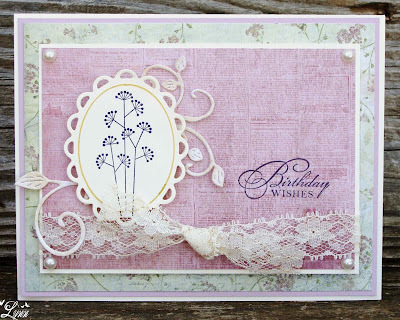 Love the floral stamp, love the leaf die, love the lace tied in a knot! Great job! Isn't that funny how so many of your favourites can combine to make something that doesn't feel like your usual style? I love the soft colours & the awesome dies! Beautifully done- LOVE the lace and the beautiful DSP- they showcase off the image perfectly! Love this Lynn - especially the way you used the lace - must remember that!! Those colours are some of my favourites. Wowie! Soo Pretty in pink and Lace! 8-) Love this Lynn! and I Love the cheery lynn leaf flourish too! Every time I see it I think I must add this one to my stash for sure! Love it! 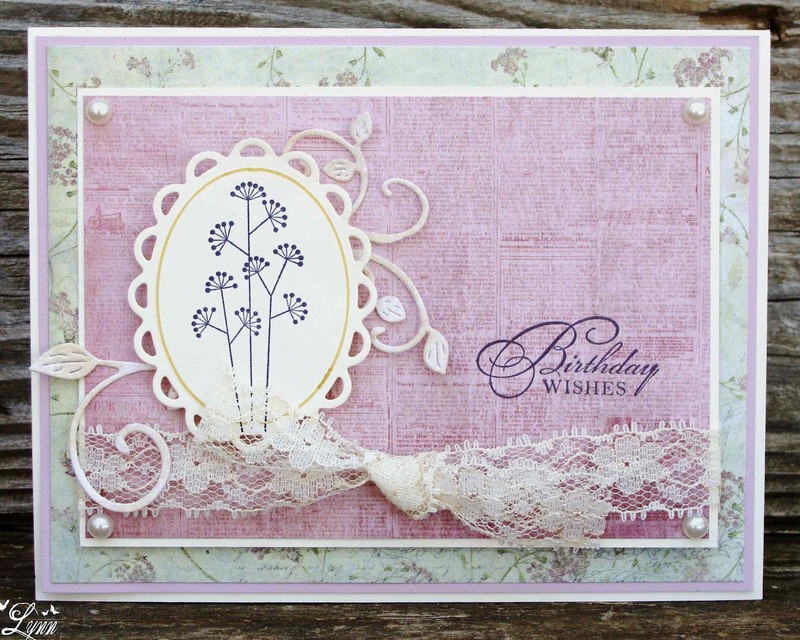 This is sooo soft and pretty, Lynn...I love the flower image and the lace looks beautiful!!!! Lynn, this is lovely! So soft and pretty!!! Such a great way to show off your favorites too! Oh Lynn! This is a favorite! Tied lace - LOVE LOVE LOVE it - have never done that before but it is smashing! I hope you don't mind if I 'borrow' this idea! The flourishes are the perfect pop for the nestie and pearls with swirls - what's not to love? I too have some DP that I look at - move on - go back to - move on - look at it again - move on....Sometimes wondering what the heck do I keep this for... Well this is why - cuz sometimes it just becomes the PERFECT solution! This card is so wonderful!